Written by: Rebecca Miller on September 21, 2012. With Halloween coming up, people are starting to look into costumes. Whether you buy yours or making it yourself, there is one thing that everyone will be looking at: Fabric. This is one of the biggest choices you’ll make when deciding what to do. Sometimes you just know when you find the fabric you want! Most standard bought costumes from places like Amazon or Spirit Halloween are made from pretty easily cared for fabrics like polyester or nylon. Not that most comfortable fabrics in my opinion, but ones you can’t destroy unless you really try. When buying a pre-made costume, order it enough ahead of time to give yourself time to send it back if there is a problem. I’ve had a couple friends bring me purchased costumes that needed to be reworked before they could be worn. One was a Renaissance styled man’s jerkin that needed the lacing eyelets redone and another was a belly dancer costume that arrived with a lot of the beadwork broken. One upside to these kind of problems is that you can usually buy these kind of costumes for a reduced price. The downside is that you have to have the sewing skills and the time needed to fix the problems, or in my friend’s case, a friend with sewing skills–and a gromiting kit. When making a costume from a pattern, read the back of the pattern envelope. Each pattern gives a list of fabric suggestions. These are the types of fabrics that will create a drape and look similar to the costume pictured on the front of the envelope. Each fabric changes the way the garment will look. When substituting something other than the recommended fabrics, always make sure that it is a fabric that behaves the same way the recommended fabrics do.Some fabrics are equal substitutes, such as cotton broadcloth for another non-stretchable fabric such as satin. I wouldn’t suggest satin to a novice seamstress, though. It is rather difficult to work with; it needs to be pinned very close together to keep it from creeping on itself, and it requires a very smooth surface so you do not snag the fabric. Also, linen/jute osnaburg may be substituted for silk noil at a fraction of the price. It is not as high quality a fabric, but will give a similar look for less money. 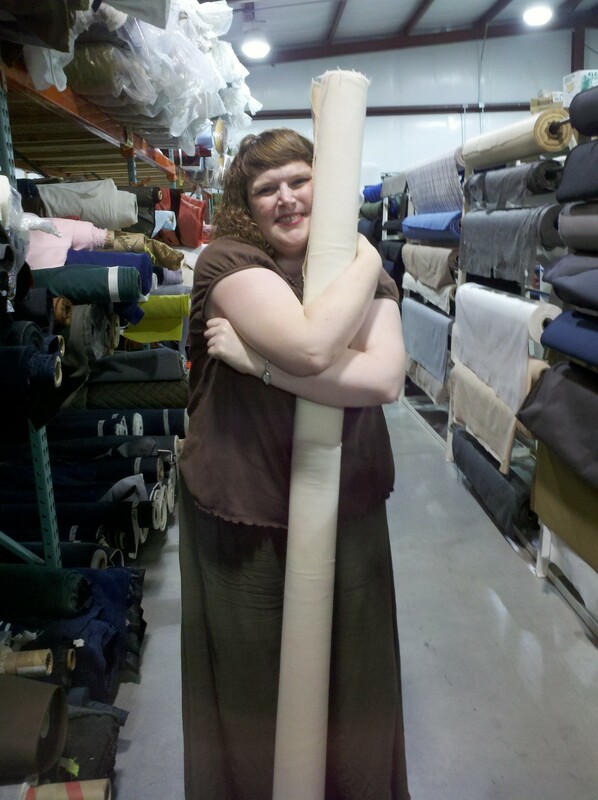 When in doubt, ask staff at the fabric store. As a whole, they know how each fabric behaves and can recommend other fabrics and techniques to try. Osnaburg side by side with Silk Noil. 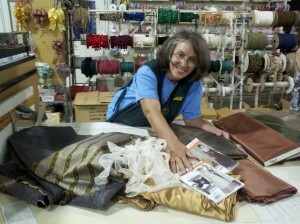 Friendly Staff at Fabric Stores are Always Ready to Help as the lovely Cheryl Peoples Shows! If you’re not sure of the sizing in a new pattern, you may want to make a practice garment out of an inexpensive fabric to try first. One way to cut cost is to use bed sheets. You can also save money by trying novel stabilizers. I once picked up a discount fitted sheet for fifty cents in the same color as a much more expensive silk to use as a stabilizer between the layers where it wouldn’t be seen, but it worked just as well as a much expensive fabric. You can save money in these little ways, but never skimp on facing. It stabilizes and gives shape to a garment. When working on costumes, always been open to other ideas. 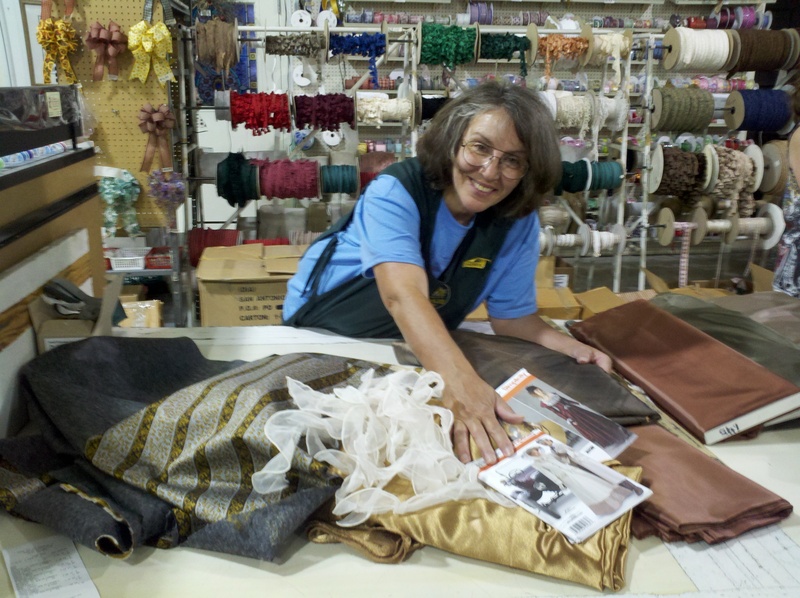 Sometimes you’ll find the perfect fabric, but not in the color you originally intended. Consider buying it anyway: It may end up being far better than your original idea. Such as my current project; I had envisioned it a emerald green, but I ended up with a lovely taffeta in an olive green with a black and gold sheen that is a far more rich-looking fabric than the original idea. Always be open to try something new and don’t be afraid to pick the brains of the people at the fabric store. Some of them have made the most amazing garments. What fabric store is that in the top picture? It looks wonderful! I’ve had excellent help from people in fabric stores, but lately, a couple of the big ones seem to be hiring people who don’t actually sew themselves. It does cut down on what they can help with! It’s a local surplus store called Surplus City (http://surpluscityinc.com/). Most of the fabric is ends and overruns from the garmenting district in either New York or Pittsburg. They have 4 locations now, but all east coast: Altoona, Williamsport and Carlisle, PA and LaVale, MD. They deal in everything from craft items to hardware and Army Surplus. I’ve been told by other east coast costumers that Surplus City has been a Mecca for costumers for years. If you’re ever out this way, absolutely worth the look. Hm, yes. Bit of a drive from here!